Help your little one's love for the ocean blossom with the My Life As Snorkel Toy Accessories Play Set for 18-inch Dolls. 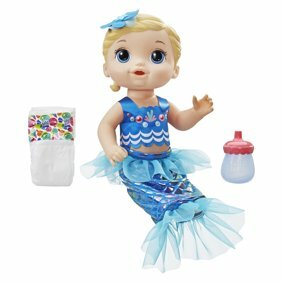 Perfect for the child who loves swimming , this accessory set includes everything your child needs to create their very own beach vacation and is ideal for fun and imaginative play with their My Life As 18&quot; Dive Instructor Doll (sold separately). The 20 piece set includes a snorkel, goggles, swim fins, mesh bag, treasure chest, five coins, three jewels, three seashells, three anemones, and one piece of coral. As part of the full collection of My Life As toys, the My Life As Snorkel Toy Accessories Play Set for 18-inch Dolls provides hours of playtime for any child over five and makes a wonderful Christmas, Hanukkah, holiday, or birthday present. Help your little one's love for the ocean blossom with the My Life As Snorkel Toy Accessories Play Set for 18-inch Dolls. Perfect for the child who loves swimming , this accessory set includes everything your child needs to create their very own beach vacation and is ideal for fun and imaginative play with their My Life As 18" Dive Instructor Doll (sold separately). The 20 piece set includes a snorkel, goggles, swim fins, mesh bag, treasure chest, five coins, three jewels, three seashells, three anemones, and one piece of coral. As part of the full collection of My Life As toys, the My Life As Snorkel Toy Accessories Play Set for 18-inch Dolls provides hours of playtime for any child over five and makes a wonderful Christmas, Hanukkah, holiday, or birthday present.